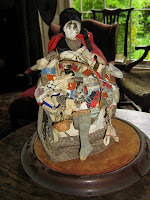 Daniel Agnew, world renowned antique Teddy Bear, doll and toy expert. This blog will deal with all interesting things related to these subjects. Steiff, Farnell, Bing, Chiltern, Merrythought, Chad Valley, lead hollow-cast figures, tinplate, bisque, wood, wax cloth and china dolls. Wooden, paper and composition toys.. 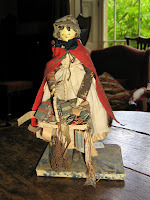 Here are five very fine 19th century pedlar dolls. 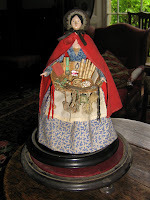 Models of women who used to travel around the country selling their wares from trays, the often wore a red woolen hooded cape. 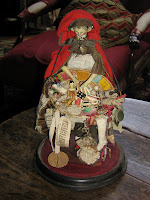 Two of them are wooden Grodnerthal dolls, the top right doll has a head made from wisen fruit. The bottom one has a very fine composition head. Double click onto each of the images and look at all the wonderful things that they carry in their trays. 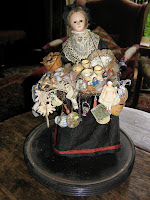 These were normally assembled in Britain, but often the dolls were bought in from Germany.